Jill O'Bryan, nm.8.06 (detail), 2006, graphite on paper, 138 x 80 inches. August 28, 5 – 6 P.M.
August 28, 6 – 7 p.m. This exhibition pairs Jill O'Bryan's Ground and Breath Drawings, two separate but related bodies of work. The Ground Drawings (or “Frottages”) are made in New Mexico’s high desert, where the artist rests oversized sheets of paper along the mesa and then rubs them with graphite. In so doing, O’Bryan renders an intricate impression not only of a moment within the rock’s geologic formation, but also of her singular interaction with the ground. The result is a landscape drawing at once detailed and vast in scale. O’Bryan’s Breath Drawings also have a corporeal quality. On square sheets of rice paper, the artist registers her breaths in hours-long sessions, over days, weeks, and years. Her record-keeping textures the paper with each breath marked and layered upon its surface. Shared_Studios is a global public arts initiative. Each Shared Studios_Portal is a gold shipping container equipped with immersive audio and video technology inside. When you enter one, you come face-to-face with someone in a distant Portal live and full-body, as if in the same room. Programming in the TXST_Portal ranges from unstructured "open hours" to curated events, such as Shared_Meals, expert roundtables, and performances. Student organizations, faculty members, and others are encouraged to inquire with TXST_Portal Curators about the development of programming around a specific topic or theme. Use this form to contact TXST_Portal Curators, Texas State University alumni Kaytlin Esparza and Tafari Robertson. Connect with Shared_Studios via Facebook, Instagram, Twitter, and LinkedIn. To share this project on social media, use @sharedstudios, @txstgalleries, #sanmarcosportal, #txstinnovation. TXST_Portal is funded by the Texas State Galleries, the School of Art and Design, the College of Fine Arts and Communication, the McCoy College of Business Administration, the Department of Housing and Residential Life, the College of Liberal Arts, the College of Education, the College of Applied Arts, University College, the College of Health Professions, the Common Experience, the Honors College, and the Center for Diversity and Gender Studies. Soomin Jung, Matterhorn: Iceberg, 2014, colored pencil, graphite, gouache, 11 1/2 x 15 inches. 2017 School of Art and Design Faculty Exhibition. september 28, 5 – 6 P.M.
Every two years, Texas State Galleries showcases the work of faculty members currently teaching in the School of Art and Design at Texas State University. This year's exhibition features the work of: Sterling Allen, Sunday Ballew, Hollie Brown, Adrienne Butler, Shawn Camp, Jimmy James Canales, Roger Colombik, Courtney Cone, Michel L. Conroy, Erin Cunningham, Jeffrey Dell, Erina Duganne, Teri Evans-Palmer, Jonathan Faber, Shannon Hayes Faseler, Joey Fauerso, Veronica Fernandez, Tommy Fitzpatrick, Anthony Francis, Michael Furrh, Brandon Gonzalez, Nathaniel Haefner, Brittany Ham, Margo Handwerker, David Hefner, Bethany Johnson, Brian Johnson, Jules Buck Jones, Soomin Jung Remmler, Sean Justice, MiHyun Kim, Alice J. Lee, Jeffrey Lieber, Jessica Mallios, Tom May, Kathleen McShane, Mark Menjivar, Annie Miller, Erik Nielsen, Beverly Penn, Elvia Perrin, Caprice Pierucci, Matt Rebholz, Jason Reed, Randall Reid, Liz Rodda, Molly Sherman, Sherry Snowden, Jennifer Stob, Barry Stone, Mark Todd, Laura Barth Turner, and Lana Waldrep Appl. Ana Baer Carrillo and Heike Salzer in Flatey, Iceland filming WECreateIce, 2016. Homepage: Ana Baer Carrillo and Heike Salzer at Jökulsárlón, in Iceland filming WECreateIce, 2016. Images: Ingi Jensson. Espacios Latentes/Latent Spaces is the first gallery exhibition of site-specific screendance works by Ana Baer Carrillo. Site-specific screendance couples two contemporary dance forms: site-specific dance—a choreographic process wherein movement is generated in response to a specific site—and screendance, a hybridization of cinematography and choreography wherein the relationship between the dancer and the filmmaker constitute an improvisational duet. In Espacios Latentes/Latent Spaces, Ana Baer Carrillo and her collaborators push this medium further, exploring the relationship between sites of origin and their range of re-presentations, whether on a screen, a stage, in an art gallery, or elsewhere. To share this project on social media, use @txstgalleries and #latentspacesart. October 24, 6:30 – 7 P.M.
A montage of the site-specific screendance works on view inside of the Galleries will be performed prior to the exhibition’s opening. The roughly 30-minute performance, featuring some of the projects' original dancers, will begin in the second-floor lobby of the School of Art and Design (JCM). November 16, 7:30 – 8:30 P.M.
Espacios Latentes/Latent Spaces will close with a performance by the Texas State Mysterium for New Music Ensemble inside of the exhibition space. The event will feature a special performance of Brian Eno's Music for Airports, as well as works composed by Richard D. Hall and Mysterium for the site-specific screendance works on view in Espacios Latentes/Latent Spaces and for that exhibition's opening performance on October 24. For Freedoms Lawn Signs, Brooklyn Museum, 2016. Image: Wyatt Gallery. [ lobby ] October 2, 5:30 – 6:30 P.M.
[ Shared_Studios ] October 30, 12 – 1 P.M. Inspired by American artist Norman Rockwell’s paintings of Franklin D. Roosevelt’s Four Freedoms (1943)—freedom of speech, freedom of worship, freedom from want, and freedom from fear—For Freedoms is a platform for greater participation in the arts and in civil society. 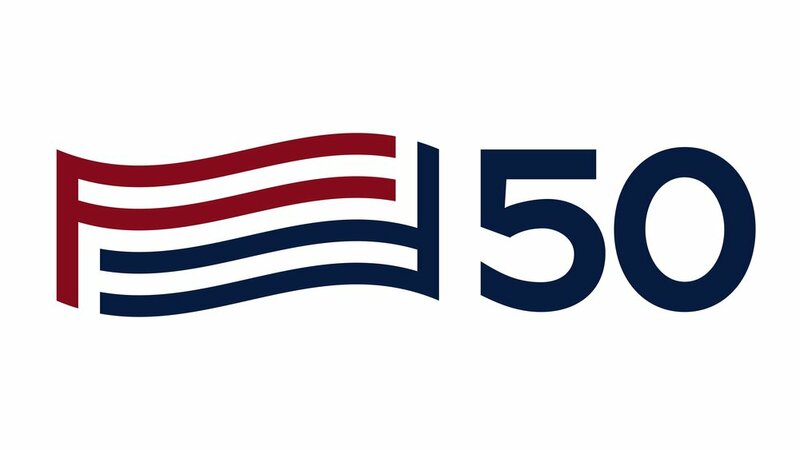 The For Freedoms 50 State Initiative is a new phase of programming scheduled from September through December 2018, during the lead-up to the midterm elections. For Freedoms has developed a network of artists and institutional partners who will produce nationwide public art installations, exhibitions, and local community dialogues in order to inject nuanced, artistic thinking into public discourse. Centered around the vital work of artists, these exhibitions and related projects will model how arts institutions can become civic forums for action and discussions about values, place, and patriotism. As part of the 50 State Initiative, Texas State Galleries will host two sign-making events. At these events, participants are encouraged to produce and publicly display their own definitions of freedom by filling out lawn signs provided. 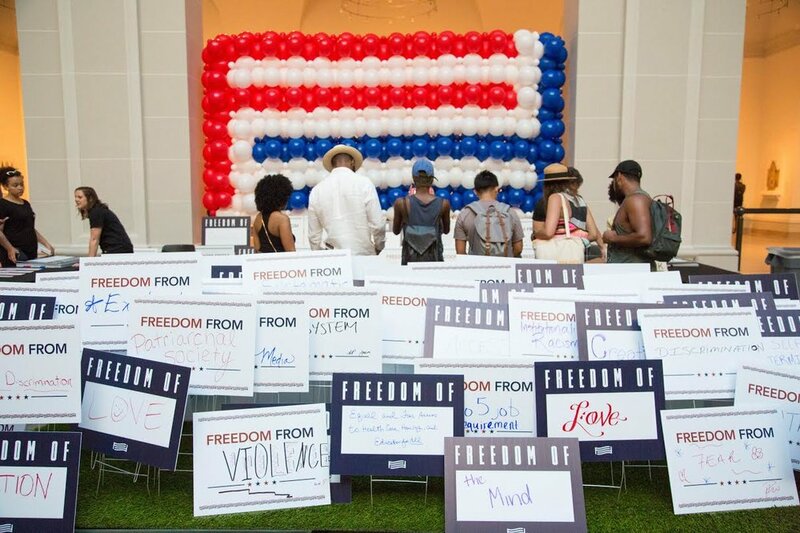 The lawn signs allow every participant to define freedom in their own way. Together, they articulate a vision of freedom that contains multitudes. To share this project on social media, use @forfreedoms, @txstgalleries, #50statesinitiative, and #smtxforfreedoms. DECEMBER 3, 5 – 6 P.M. & DECEMBER 10, 5 – 6 P.M.